28 feb is mn verjaardag en dat hoeft niet speciaal gevierd te worden want 26 jaar is ook maar een leeftijd hahaha! en dus daarom heb ik op 3 maart in studio gonz een vette avond georaniseert met drie dikke vette metal bands! 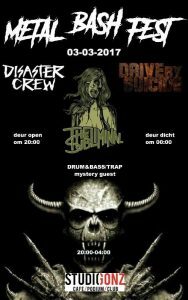 The Subliminal is a 5-piece metalband from Utrecht, The Netherlands. Founded in 2014 by Thijmen (guitars) and Milan (vocals). In the same year the band was completed by Joerie (bass), Paul (guitars) and Wes (drums). Their first self-titled demo was released early 2015. Metal. That’s right, DriveBySuicide is a metal band. 4 members from The Netherlands with different influences throwing their ideas into one big, loud, stinky, heavy, hard-hitting, in-your-face metal stew and mixing it up to form something that resembles a musical feast. Then we eat the Stew, get really sick and throw up all over the place. After scraping off the walls to collect what we’ve got in a bucket we ad seasoning and shove it in your ear. Disaster Crew is a band that mixes the 90s and early 00s metal style with rap and more modern elements and influences. With one EP named “the prologue” already being released in 2016, they are eager to further develop the achieved sound into something that should be indistinguishable.